Is Your Shower Slowly Killing You? This post title may suggest the scary end to a horror movie, but it isn't. However, while I can guarantee that there is no blood and gore, and no one is murdered, it is very important to read and understand how something we take for granted -- like showering -- can affect our health more than we realize. Problem: Most cities chlorinate their municipal water supply. That means that if you are on city water, you are being exposed to chlorine. With your skin being your largest organ, it is soaking up all the contaminants that are in the water supply with each shower you take. Chlorine is especially bad for those with thyroid issues, as it blocks thyroid receptor cells. According to the U.S. Council of Environmental Quality, the cancer risk to people who drink chlorinated water is 93 percent higher than among those whose water does not contain chlorine. Americans are ingesting from 300 to 600 times what the Environmental Protection Agency considers a “safe” amount (And bathing in it is not much better). If you are on a well system, you may want to have your well tested to see what contaminants may be lurking around, but chances are you won't have to worry about chlorine. Problem. Most commercial shampoos and conditioners have chemical poisons in them. Some of the worst offenders include the sulfates: sodium lauryl sulfate, sodium laureth sulfate, and ammonium laureth sulfate; then there's methylchloroisothiazolinone and methylisothiazolinone, other neurological cancer causing toxins. And just as bad are the paraben family: propylparaben and methylparaben (along with their cousins). There are at least a dozen more that I won't list. All of these may contribute to cancer and other diseases. Solution: There are so many natural and safe alternatives that you can try. I personally use Miracle Soap on my hair and face. I am not a huge fan of Dr. Bronner's castile soap for my hair, but you may like it, as many swear by it. Other options are plain water washing, the no 'poo method, and a natural shampoo / conditioner you can find at Trader Joe's or Whole Foods market. I have used a tiny amount of coconut oil as a conditioning treatment about once a week or so, and then shampoo it out. Another conditioning option is a vinegar rinse. Problem. Fragrance, artificial colors and dyes, BHA, antibacterials like triclosan, parabens, formaldehyde releasers, petrolatum and mineral oil. There are so many toxins and chemical ingredients in various soaps that it is impossible to get a comprehensive list. Solution: If you have a local Farmer's Market near you -- you can be sure to find some homemade soaps for sale! You may be paying up to $5-7 per bar, but you won't be poisoning yourself. You can always learn the craft of soapmaking, which is very addicting. Some of my favorite soaps come from Sunshea Homemade Soaps -- they are at my local Farmer's Market back home, but they do ship around the country. Another thing you may not be aware of is that you don't really need to wash your whole body, every time you shower. In order for your skin to be its healthiest, you want the natural oils on it (sebum). If you wash them off every day, you are going to end up with dry skin that requires you to put back moisture -- (and even more toxins!). It is probably best to wash your private areas (and armpits) only, unless you are actually dirty. A good rinse is all the rest of your body parts need. Problem. Most lotions are filled with toxins: chemical emulsifiers, aluminum compounds, BHA/BHT, alcohol, and other harmful ingredients, not to mention the fragrances they use. My favorite lotion was Nivea -- before I realized all the ways I was putting toxins into my body and went 100% to homemade or natural products. I still love the smell of the original Nivea, though. Solution: Make your own! This is so easy with just a few ingredients, and you can have luxurious homemade body butter (which you can even package up nicely and give as gifts!) Other non-toxic options include coconut oil (this is ok but doesn't seem to work as well as the body butter for me, but other people say that is all they need), Miracle II Moisturizing Lotion (I am a huge fan of the Miracle Soap products, and use the lotion on my face in the morning). Sunshea Products also has some VERY DELICIOUS scented homemade lotions. Problem. Yes, more toxins in shaving creams. Sounds like a broken record, but the chemicals that are seeping into our bodies just for the sake of "showering" is becoming ridiculous. Solution:You know what makes an awesome smooth shaving cream? Coconut oil. It works for us women, and for the men, too! Problem. Where to begin with the problems of anti-perspirant? Propylene glycol, aluminum, fragrance, triclosan, anti-perspirants have been accused of causing breast cancer, Alzheimer's disease and more. You don't want to increase your risk, trust me. Especially when there are so many alternative options that work amazing. Solution: Here are 5 natural deodorant options -- there are also tons of recipes you can make at home with just baking soda and coconut oil or bentonite clay. Sometimes baking soda can be irritating, so you have to figure out what works for you. I was amazed at how well the slice of lime worked for me, because it is something that is so unusual and not something you would think would work to control your "smell". Problem. Yada yada. By now I sound like a broken record. Because of the many "trade secrets" of perfume manufacturers, they do not have to release all the ingredients in their products. But they just add to the barrage of toxins you already have put on since you stepped into your shower this morning. The average perfume contains 14 chemicals that are no good for you, are endocrine disruptors and carcinogenic. Solution: Essential oils! I love essential oils and don't recommend just one brand, and I don't sell any. I have so many friends who do, and I just buy what I need, when I need it. I have close to 100 bottles of oils in my cupboard right now. I recently made some more perfume as I ran out of the batch I made last year (I made about a dozen different "scents" and felt like a total chemist). 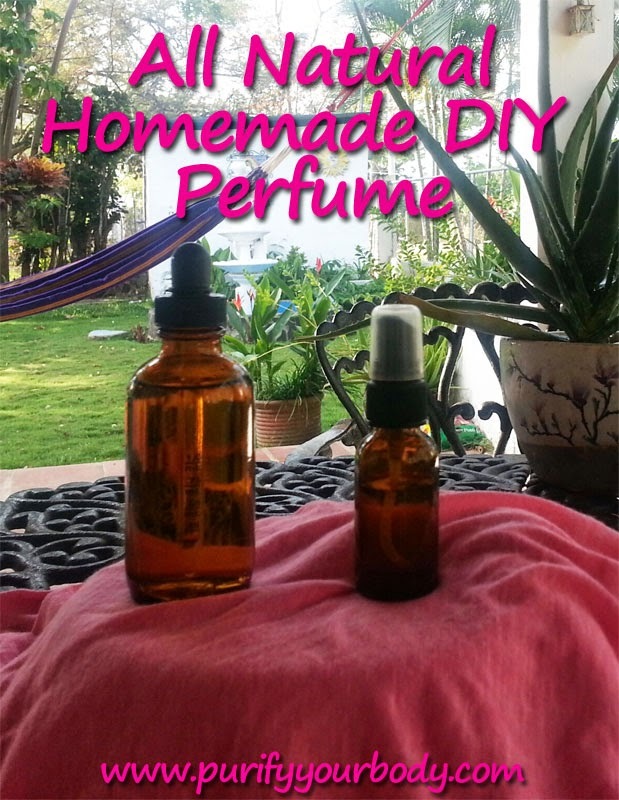 Here is an easy recipe to make your own perfume. We could move on to discuss the horrendous amount of chemicals in makeup and hair products, but I will leave those for another day! Wasn't the list above enough already? It is impossible to live in a bubble. And it can be overwhelming when you see all the toxins we expose ourselves to on a daily basis. If it was just a few things here and there that we exposed our bodies to, then our body's natural detoxification system could probably take care of it. But as your body is constantly bombarded with toxins left and right -- from personal care products, to foods we eat, the environment around us filled with pollution, and even the receipts at the store containing BPA, it gets very frustrating. You may think that it isn't worth it to even try, because there are too many harmful things out there. DON'T GIVE UP. The best advice I can give is to switch your personal care products to non-toxic, homemade or all-natural versions. Slowly do the switch if a full about-face is too hard. One product at a time. (Start with switching your deodorant and adding in a chlorine filter! Maybe instead of switching perfumes, start by spraying it only on your clothing instead of directly on your skin). And start using my detox foot pads to clean your body of the toxins you are exposing it to! That should be able to give you relief knowing that while you may not be perfect in avoiding toxins, you sure are taking care of yourself by pulling them out of your body! One thing that I really enjoy while I am cooking or baking, is to reach for my bottle of homemade vanilla extract and use it in my recipe. In the past I always used vodka, but then I found out that most vodka is gluten-grain-based and is not gluten free. (Potato-based vodka is gluten free, though). You can see my Stanislav vodka bottles in the picture, I always keep my vanilla beans in the vodka when I use it only for myself (otherwise I package it in nice bottles and give to friends as gifts). But this time I am going to try some good old Bacardi Rum with my Madagascar vanilla beans. You don't have to worry about buying organic vanilla beans because by nature of how they are grown and cultivated, you won't have to worry about them being exposed to pesticides or herbicides. I prefer Madagascar as it gives me the flavor I recall from my childhood, but there are quite a few different types. I buy mine on Amazon.com. One thing to note for me -- vanilla beans make me sick. Seriously. Here I am giving you instruction on how I make vanilla extract and the vanilla scent is an instant headache for me. I can use the extract easily and LOVE to cook with it. But I cannot cut the beans and scrape out the insides (the "caviar"). That is why I have a husband. His FAVORITE scent is vanilla. We are a match made in heaven! (or mis-matched, depending on how you look at it, haha). And he hates his picture taken so I did not take a picture of him slicing open the vanilla beans and scraping out the inside caviar. 1. Pour out about 4 oz of the Rum (so there is enough headspace). I don't drink alcohol but my husband does, so this doesn't go to waste. 2. Using a cutting board, slice the vanilla beans lengthwise. Scrape out the "insides" (called caviar) and keep them. You don't have to scrape them out but I find that the vanilla is richer when you separate the caviar from the bean.... however, it makes it more important to strain the vanilla before use. Your choice. 3. You can cut the vanilla beans in half as well, if your container is smaller and you need them to fit. 4. Stick the vanilla beans and caviar into the bottle of liquor. Close the lid and shake gently. 5. Store for a minimum of 6 weeks in a dark place (cupboard is fine). Shake as often as you can, at least a few times per week. 6. After the recommended period of time, you can strain the vanilla (via cheesecloth or strainer depending on the size of the beans and if you separated the caviar). Put it in whatever bottles you want (for gifts) or even leave it in the same bottle, for your own use. (No need to remove the vanilla beans if you are keeping it for yourself! The flavor will become richer and bolder as time goes by). ENJOY! 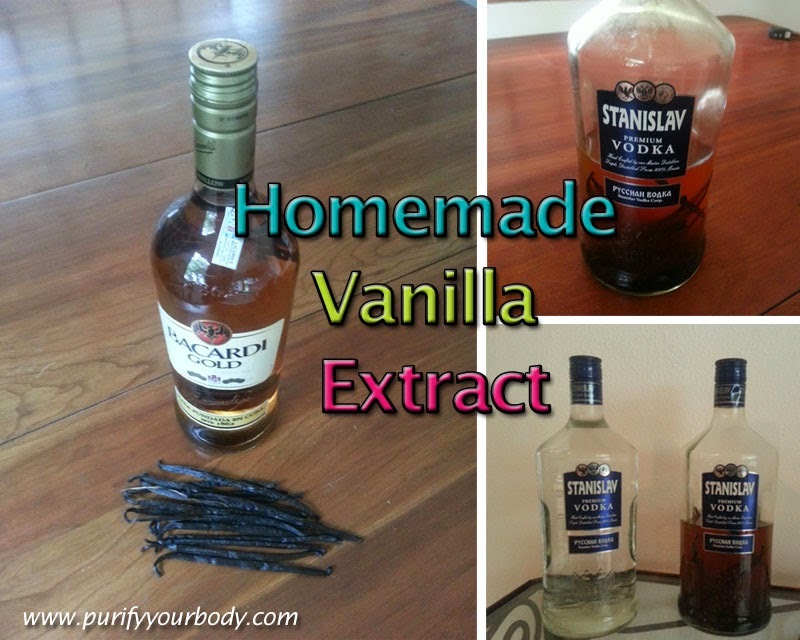 Homemade vanilla is a lot cheaper than real vanilla extract from the store, and it has no additives in it, so you know exactly what you are getting. And no one likes using the cheap imitation vanilla, so this one's a winner. As you gradually change from toxic, chemical-based products, to homemade, natural products you will find a great sense of peace knowing you and your family are being exposed to less toxins. Check out some of my other posts about all natural DIY recipes, from personal care products like homemade body butter, to homemade mayonnaise. Thanks to my awesome step mom who is Mexican, I was raised on DELICIOUS HOMEMADE MEXICAN FOOD. Nothing is better. It still is, to this day, my favorite cuisine. And thanks to my aunt, I get to share this SUPER SIMPLE recipe with you on how to make your own red enchilada sauce. (I prefer red over verde sauce). STEP 1: Add the vegetable oil, flour, and chili powder to a medium pot. Turn the heat on to medium and whisk the ingredients together. Continue to whisk as the mixture begins to bubble. Whisk and cook the mixture for one minute once it begins bubbling. STEP 2: After one minute, whisk in the water, tomato paste, cumin, garlic powder, and cayenne pepper until smooth. Allow the sauce to come up to a simmer. Once it reaches a simmer it will begin to thicken slightly. STEP 3: Starting with a 1/2 teaspoon, add salt to taste. I used about 3/4 teaspoon total. The sauce is now ready to use! 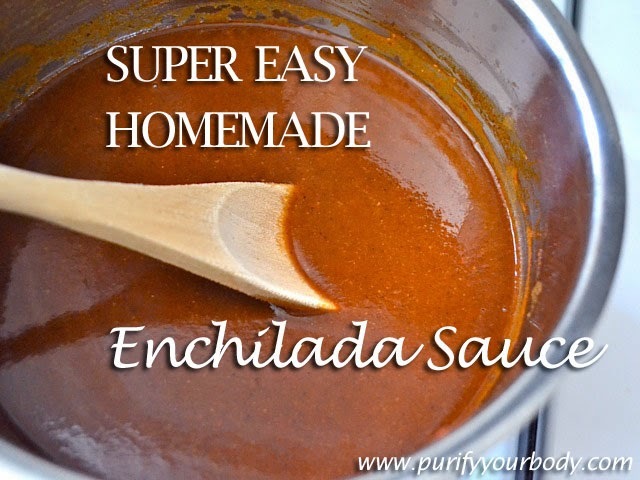 Enchilada sauce can be poured over enchiladas, burritos, stuffed poblanos, or used in casseroles for extra flavor. And be sure to put TONS of queso on top (and melt!). 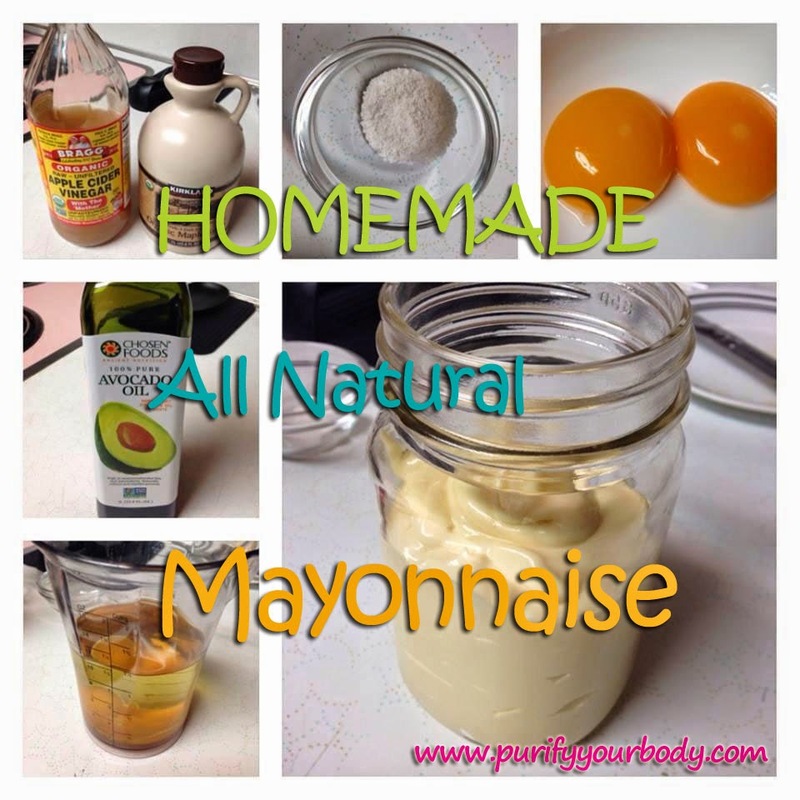 DIY Homemade All Natural Mayonnaise Recipe - In Only 5 Minutes! I LOVE mayonnaise but hate how my favorite brand, Hellmann's, uses GMO soybean oil and natural flavors (which most of the time means MSG). Since I use my DIY Homemade Ranch Dressing Mix (MSG free!) recipe all the time, mayonnaise is a staple in my house. I have been looking for an easy recipe for a long time, and a friend of mine shared this one with me. Oh My! It is so easy and so tasty. You have to try it! 1. Put everything except the oil in a jar. With a stick blender, start blending. 2. Add the oil as you are blending. 3. Once emulsified, it will thicken up and be ready. Note: If you do not have a stick blender you can use a hand whisk, but it will take extra man power. This mayonnaise should last up to a week in the fridge if stored properly, or if you culture it (with a tablespoon of lacto-fermented whey) it can last up to a month. So many things we use in our daily life are filled with toxic chemicals, including sweet smelling perfume! As Dr. Mercola puts it: " Hidden behind some perfume's pleasant scents are toxic chemicals linked to hormone disruption, reproductive problems, and even cancer." The average perfume contains 14 chemicals that are not listed on the label (identified only as "Fragrance") among the average of 15 chemicals that are listed. Phthalates: Another synthetic preservative that’s carcinogenic and linked to reproductive effects (decreased sperm counts, early breast development, birth defects) and liver and kidney damage. So, let's make our own perfume -- then we know the EXACT ingredients that we are using, and avoid toxic chemicals that can cause health issues for us and our family. We will be using pure essential oils from my friend, Alethea, who owns Essential Anew. 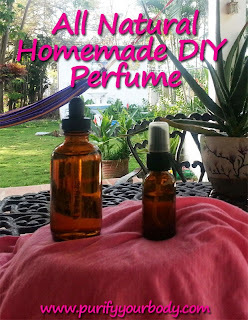 She has taught me to make my own perfume and I am sharing that with you now. First some information on mixing perfume. Essential oils must be used in an oil base. For perfume, Jojoba oil is best but Grapeseed, Apricot kernel or Almond oil will work just as well. Then we will be using vodka. It is best to add equal amounts oil and vodka, so, these recipes are for a base of 1 T. of each oil and vodka. 1. Mix together the ingredients as listed, oil and vodka first, in a dark glass container with a lid.Then add the essential oils. 2. 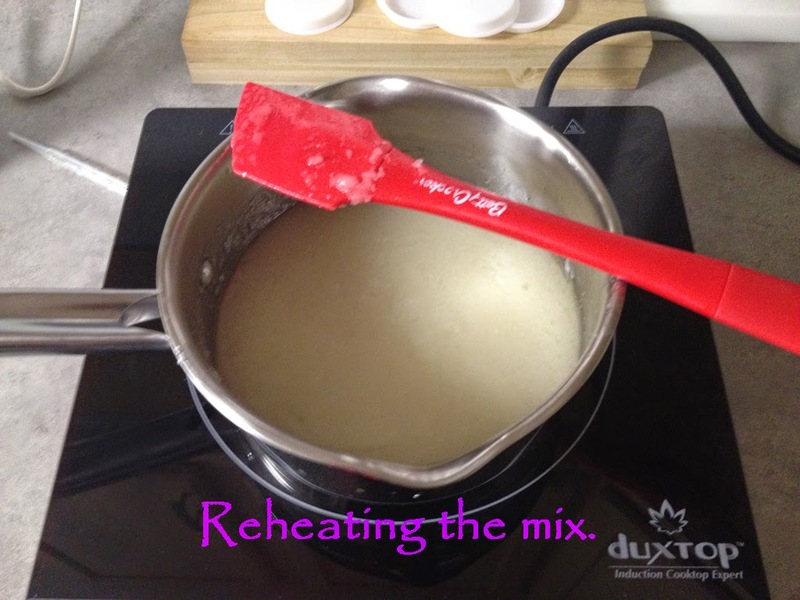 After the essential oils are added it is important to let the mixture sit for two weeks prior to use. Be sure to store the oil in a dark bottle in a cool place. 3. Shake 3 times a day. 4. After 2 weeks,you can either use the same glass container you stored the mixture in, or move it to another container with a spray top or dropper top. The thing about making your own perfume is that you can always add more of one oil or less and personalize it. My absolute favorite mixture combination is lemongrass, jasmine and sweet orange, and I do about 7 drops lemongrass, 10 drops jasmine, and 5 drops sweet orange. 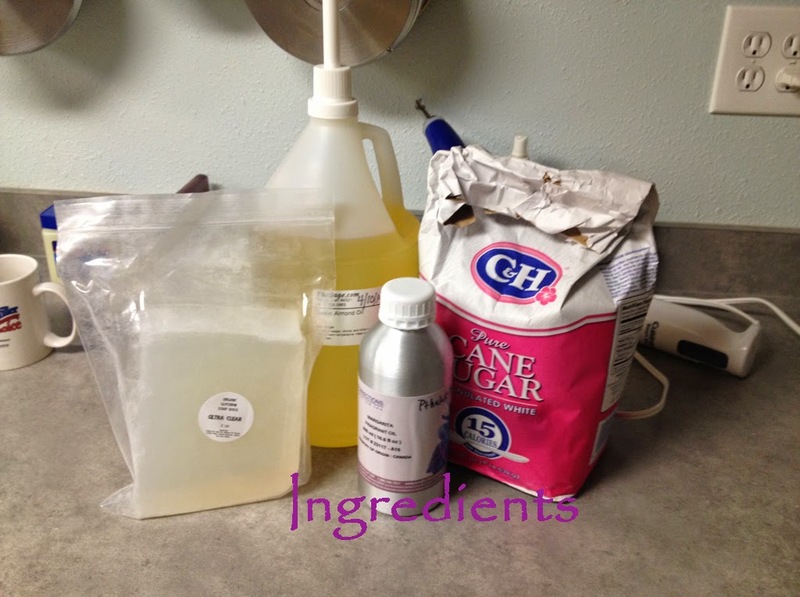 Today I am going to share a recipe of some delicious sugar body scrubs from my friend, Evelyn. I use a lot of her natural products, including her pit stick natural deodorant. Hi, my name is Evelyn, owner and operator of Sunshea Products and Swell Art, I’ve been in business since 2008 making all natural skin care products. One of my passions is to formulate new recipes. I love, love, love to make up new products that help people with problematic skin issues or for just plain luxurious pampering. 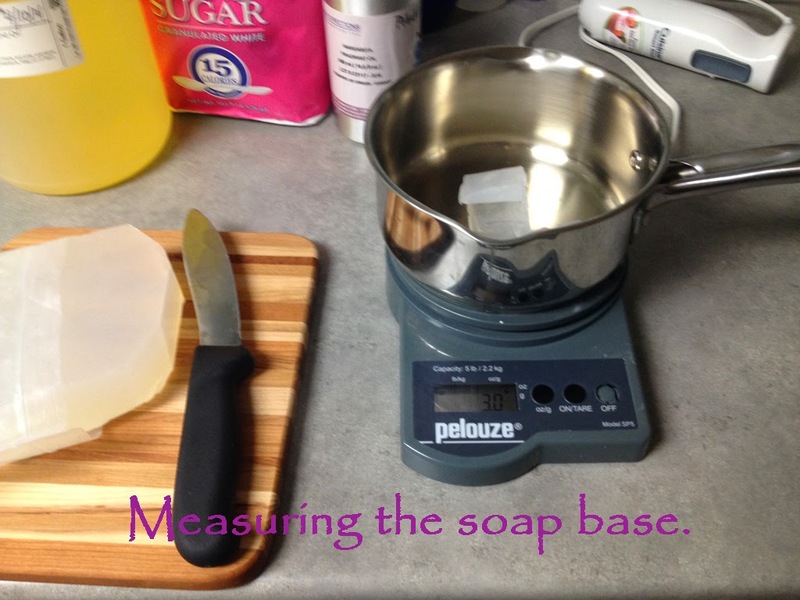 Weigh out your soap base in a SS pan and warm it slowly till it melts. 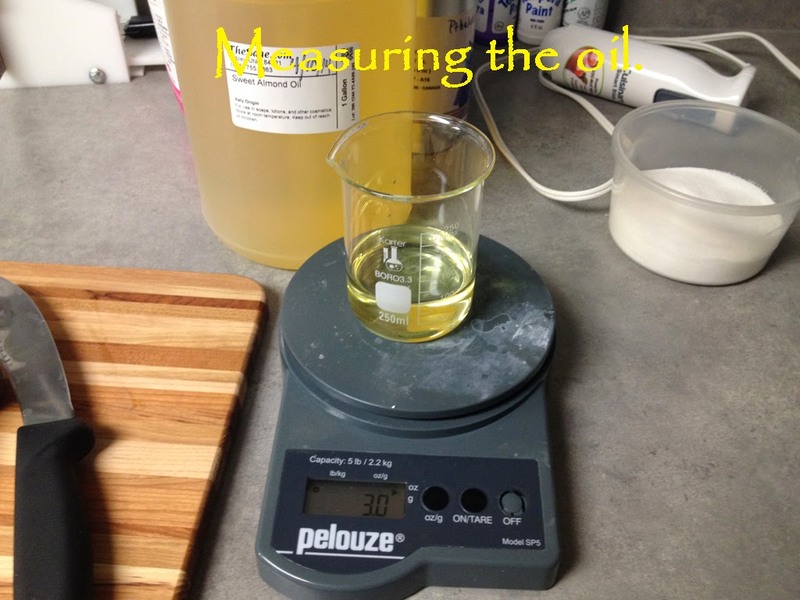 While your slowly warming your soap base, measure out your oil and sugar. 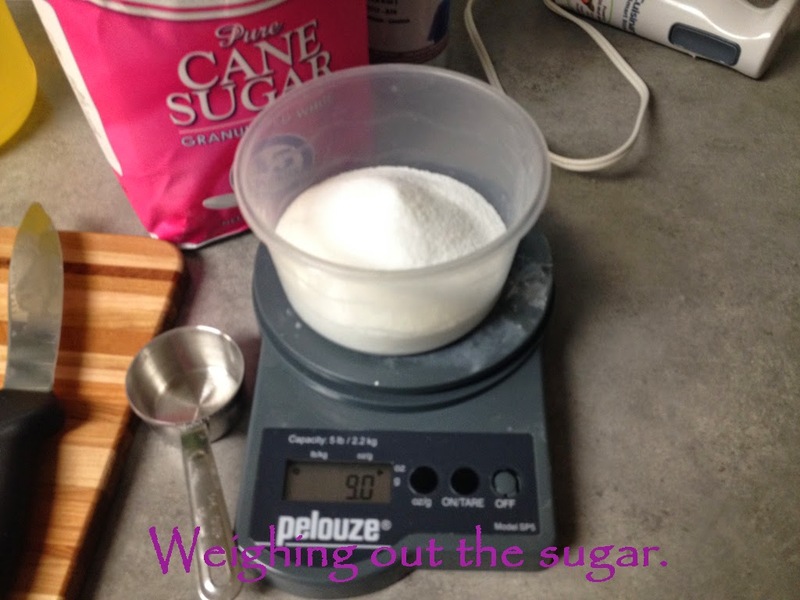 then add the fragrance oil and stir, then slowly pour in your sugar and (you guessed it) stir! Put your pan back on low heat and stir continuously until your mixture is smooth enough to pour in you mold (this being my first trial batch, I may have heated it a bit too long because some of the oil separated while cooling). Pour into your molds and let it cool all the way down. 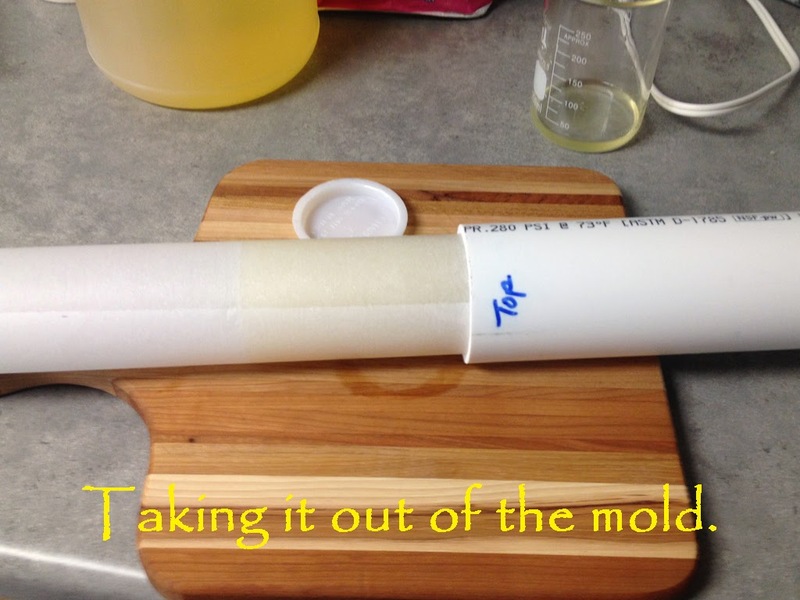 I chose to use a 2” round PVC pipe soap mold I have, but you could use just about anything for your mold, I think a cute silicone candy mold would be fun also. 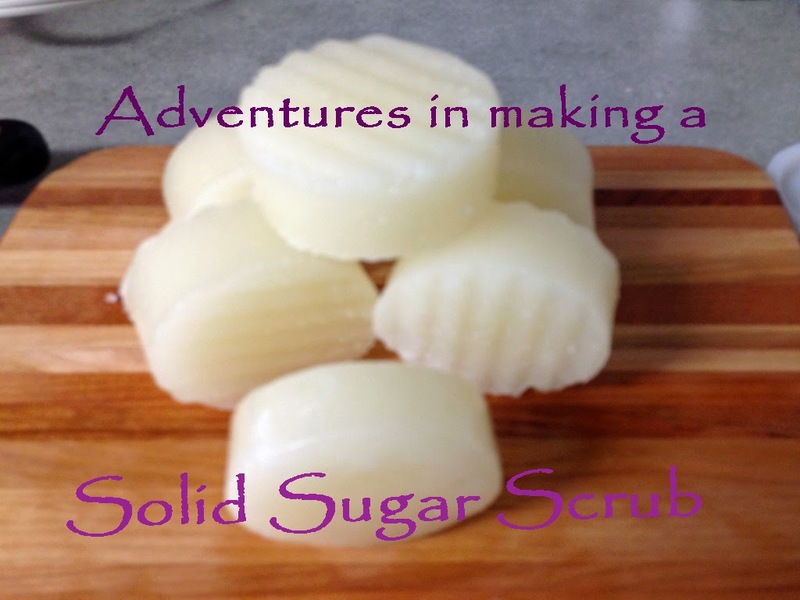 After my sugar scrub has completely cooled, I slid it out of the mold and cut it into 1” rounds with my soap cutter (in the back ground of the above picture you can see the excess oil I poured off, it didn’t seem to effect the finished products though. By the way, the smell is awesome, puts me in the mood for Margaritaville, Jimmy Buffet here I come! 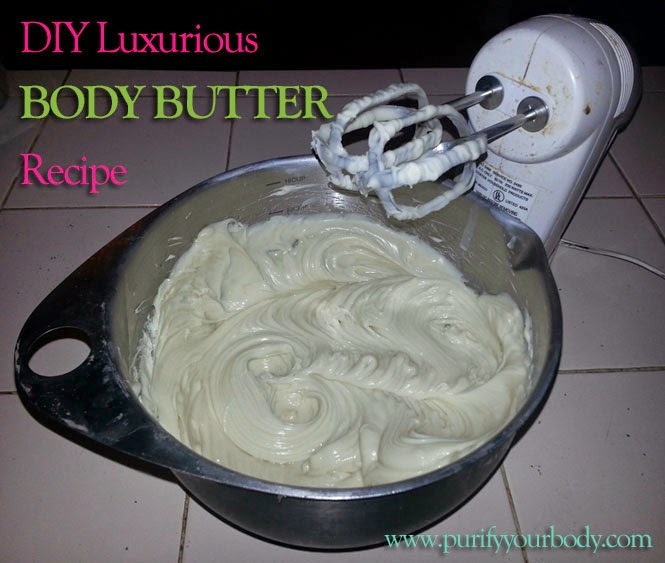 This is a very luxurious body butter that makes your skin feel soft and silky. It is pretty simple to make and also makes amazing gifts. The key is using 75% solid oil ingredients to 25% liquid oil ingredients. Once you get comfortable making this, you can experiment with other oils and “butters” to find the perfect ones for you. Melt shea butter and coconut oil in the top of a double boiler, remove from heat and let cool for 30 minutes. (sometimes I use the freezer to hurry it along, you only need it to be "warm", not "lukewarm". Wait until oils start to partially solidify (you can use your freezer or fridge to get it cooled faster, once the mixture starts to harden you know you are good to go -- there will be hardening around the edges of the bowl first, then the top), then whip with a hand mixer until a frosting-like consistency is achieved. The actual mixing should only take a few minutes. It really does look like frosting to me and I have been tempted to eat it! Place in a clean jar and enjoy! A little goes a long way. The hardest part is waiting for it to partially solidify to the right consistency before whipping. If you start whipping too soon, it won’t fluff up, so just put it back into the freezer or fridge for another 5 minutes and then try again. My favorite scents for this vary between plain jasmine essential oil, to a lavender and lemongrass blend. I also enjoy the citrus blends of lemon and orange. (But remember that any time you use a citrus oil on your skin you are more susceptible to sunburn). Our skin is the largest organ in our body and absorbs what we put on it. If you are using lotions and body butters with chemicals in them (fragrances, preservatives, color additives, etc.) be aware that your skin is absorbing the chemicals into your body, too.